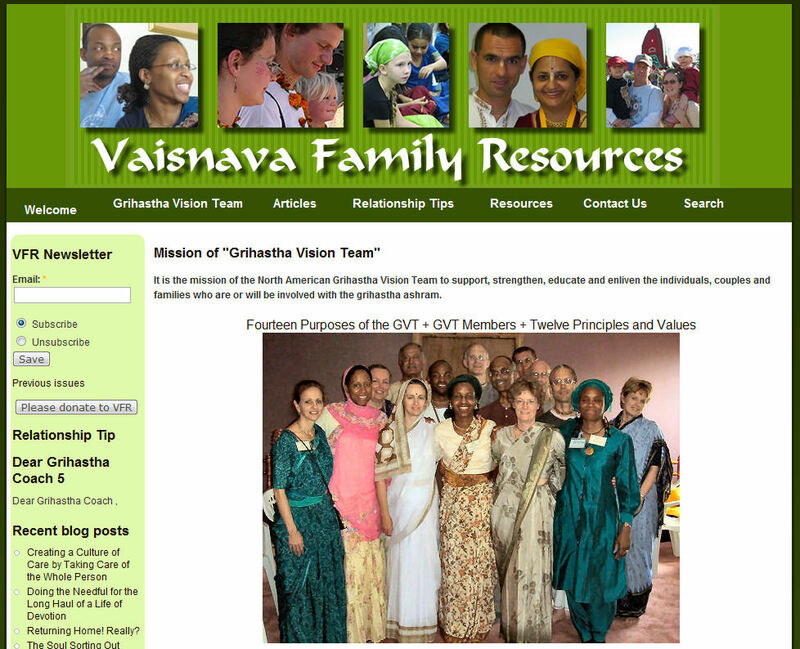 Vaisnava Family Resources - A Must-Visit Site for Families! ~ The Toronto Hare Krishna Temple! Vaisnava Family Resources - A Must-Visit Site for Families! The Grihastha Vision Team is a grass roots volunteer group of Krishna devotees who are mostly mental health or educational professionals. Our intention is to provide resources to support married couples and prospective couples primarily in North American ISKCON communities. However, the broader community of Vaishnavas, and anyone who is interested in spiritual married life are welcome to take advantage of the knowledge that is shared here. We want to help spiritualize your married life so that it will be an asset for your Krishna (God) consciousness. We welcome your suggestions to make this site relevant and useful. It's certainly worth clicking and exploring the Vaisnava Family Resources website for any members of our Toronto community who have families or are looking to perhaps get married or have kids soon!